The common name is a reference to the cockle shell-like appearance of the pods and their "burry" nature. Strumarium means "cushionlike swelling" in reference to the seed pods. Xanthium is from an ancient Greek word meaning "rough ," a reference to the texture of the plant. Cocklebur is a rough-to-the-touch annual forb that grows up to five feet tall, generally two to four feet tall. The stout stems are purplish-green with purple or black spots. Alternate leaves are large and broad and up to six inches long. They are triangular or heart-shaped (deltoid or cordate) with wavy and toothed margins, and they arise on long petioles. The plant is monecious, meaning the flowers are borne on one plant; however, there are separate male and female flowers. The greenish female flowers are clustered in leaf axils throughout the plant, while the male flowers occur in clusters towards the top of the plant. Flowers are tiny in size. The female flowers, which lack a corolla, give rise to the oval-shaped, two-chambered bur. These fruits are about one inch long, brown, and they are covered with long, stiff, hooked spines. The fruits form in the late summer and turn from green to brown with age. Cockleburs are found throughout the world. They are thought to have originated in the eastern United States then spread to the United States and to Europe. Cockleburs were first found in Europe some 50 years after Columbus arrived in North America. Cockleburs grow in disturbed, moist areas, wet fields, riparian areas and wetlands, where they can be very advantageous of disturbed conditions. Cockleburs bloom in the late summer from July to September. Their fruits may persist through the winter. 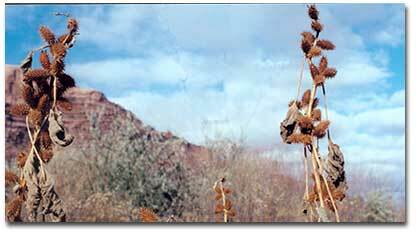 The seeds in the pods were eaten raw or cooked by Native Americans. Among the Zuni of the Southwest, the seeds were ground with squash and corn in the fraternal chamber of the Cactus Fraternity. 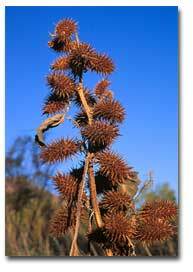 The mixture was then applied externally to help extract cactus needles or splinters or to heal puncture wounds from nails and such. Considered a weed throughout its range, cocklebur burs may cause mechanical injury to the digestive tract of livestock. In highly infested range, the coats of livestock and wildlife may have many burs twisted up in their fur. Young cocklebur plants in the two-leaf stage contain xanthostrumarin, a toxic glucoside that may be fatal to livestock. The concept of hook and clasp fasteners (e.g., Velcro) finds its origins from cockleburs. The burs attach to the fur or hairs of wildlife and livestock and use this method of transport to disperse to new sites.